Why spend the trouble and expense to enroll in even one accounting course when your objective is to learn to understand and mangage from the Income Statement and Balance Sheet? It takes much knowledge to be a CPA, but it does not require any accounting knowledge to instantly begin to understand the Income Statement and Balance Sheet and manage successfully when you read this book. The 186 page presentation includes examples, stories, tips, pitfalls, etc. for emphasis. With this understanding, you will have the tools to successfully manage your business or organization without having to go through even one accounting course. 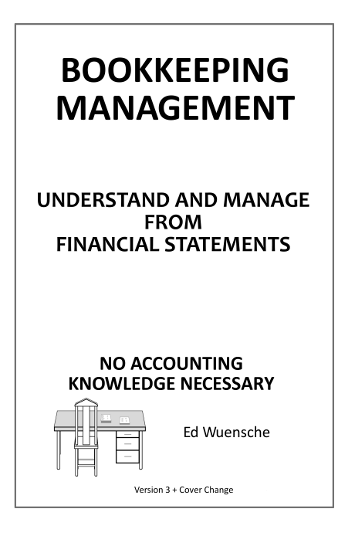 Buy this book, "Bookkeeping Management", today from Amazon.com to begin your learning process.